Have you ever seen a picture that made you want to plan a trip to see the scene in all its glory? It’s an affliction that Tim and I suffer from often. The phrase “Wow, that looks gorgeous! Let’s go!” is a regular part of our vocabulary. 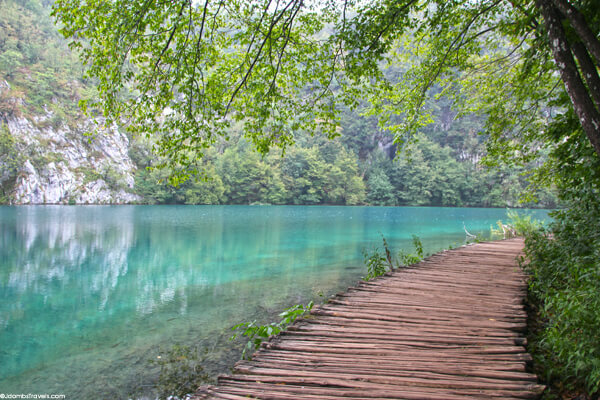 And photos of Plitvice Lakes had us wanting to go for two years now. I looked forward to finally seeing them in all their sparkling jade-green glory for our entire road trip through Croatia, Montenegro, Albania, and Bosnia. Plitvice Lakes was our very last stop before finally heading home. 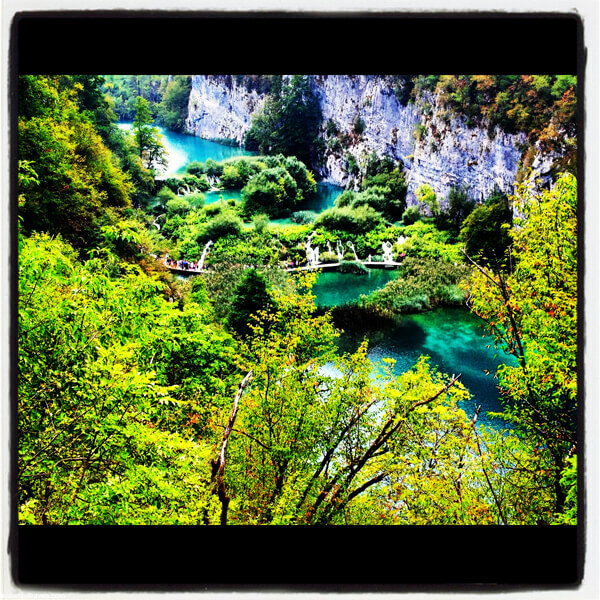 Oh Plitvice Lakes, how you let me down! I’ve thought about this. I’ve struggled with it even. With nearly 40 countries under our belts, this is the very first place I have ever been disappointed by. Was it the cloudy, cold weather? 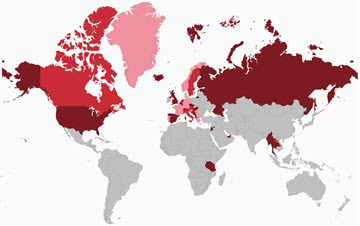 Was I just tired after eleven days and four countries? Were my expectations just unrealistic? Sure, those things probably played a factor. But honestly, I would have been even more disappointed had we planned to spend a whole weekend at Plitvice Lakes. Admittedly, the weather dashed my hopes of capturing the cascading pools of water in a photo people would ooh and ahh over. After complaining nearly all summer of the stifling heat that seemed to follow us from Greece to Provence, we arrived to gray skies and cold temperatures. After eleven days in nearly 100 F temperatures, I was less than prepared. I didn’t even have a cardigan. Thankfully, I always carry a pashmina with me. We were visiting the park on a Monday. In September. I figured it would be great because kids had gone back to school and the infamous month-long European holiday had ended. Boy was I wrong! Just as we blissfully walked hand-in-hand over the wooden bridge from the parking area to the entrance to the park, I spotted the line and nearly gasped. And just as I was picking my mouth up off the ground, more tour buses pulled up and began to unload. Just how long was the line? Well, I stood in line while Tim went and had breakfast. And then we switched while I had breakfast. And then we waited some more. Once inside the park, I felt like we were in a herd of cattle. There are walkways made of logs that are maybe about four feet wide. It was nearly impossible to pass and so I grudgingly shuffled along behind the hoards of tourists in front of me. The sun did come out, but it didn’t make a difference. The water just wasn’t the shade of jade green I’d always seen in photos, the waterfalls were narrow and weak, and the paths weren’t well signed to easily decipher the different routes. I won’t say it wasn’t pretty and we enjoyed hiking around, especially when the longest route finally broke us away from the unbearable crowds. But it didn’t knock my socks off as I had expected after hearing rave reviews. I guess I just expected more from the #2 destination in Croatia. There are 1 day tickets for 110 kuna (approximately $20) per adult or 2 day tickets for 180 kuna (approximately $31) per adult. The ticket includes entrance to the park, the bus service, and the electric ferry boat. Credit cards are accepted. Parking is not included and only kuna is accepted. There is no ATM on site, so come prepared with kuna for parking. There are number of routes that range from 2 hours to 6 hours. There are no shortage of guesthouses in the area. We stayed at House Sebalj in Grabovac, just 6 kilometers from the park, and our hostess was wonderful. While the room was simple, we did have a private bathroom and wifi. Our hostess offered us cold beers and cheese on her terrace. And she even sent us home with a wheel of cheese upon our departure. It's the end of summer…water is low and running slowly all over the Northern Hemisphere. Yes, these lakes have been on my list too. Sorry! Oh bv the way, I have an amazing video of the Croatian healer, Braco. 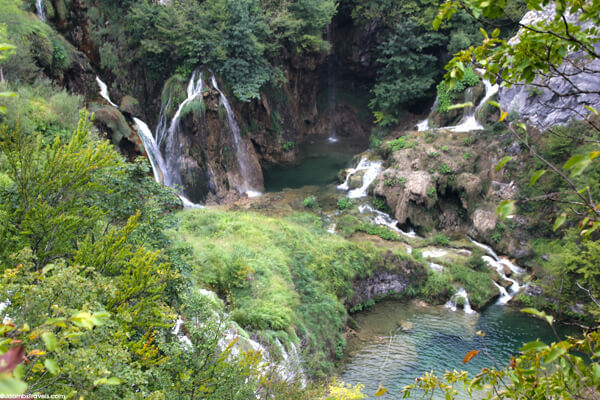 Part of it was filmed at the Plitvice lakes. It looks beyond beautiful! So, perhaps in the spring? It may have been the time of year coupled with the extremely dry summer we've had in Europe. Perhaps the falls would be better in the spring. I just wrote a similar post about how disappointed I was by Athens. I’ve never been to Plitvice Lakes, but I would be worried about this happening to me, too. So many people gush about this place, that I feel like my expectations are high without me even knowing it. I read your post about Athens today, Amanda. What a shame! I’ve been disappointed by a tour or attraction before, but never a destination. I don’t look forward to my next experience with being disappointed by a destination, but know it is inevitable. As much as I want to love everywhere we go, I know that won’t be the case. I was just there in August. The crowds were definitely a huge issue for us as well, but I still enjoyed it quite a bit! Glad to hear you enjoyed it there, Cate! It wasn't that we didn't enjoy our day, but that we didn't enjoy it as much as we thought we would. We got fresh air, exercise, and did have fun together. Thanks, Audrey! We did think it was pretty, just overcrowded. Oh I don’t know, those pics look amazing. But the large number of crowd would’ve put a damper on it, I’m sure. These are pretty high on my list to see too, but I REALLY hate crowds. So I can well imagine that I would not have been thrilled there too. Though the weather wouldn’t necessarily bother me. I like forests and waterfalls, just not being pushed or rushed. Wonder what a nice quiet time to be there would be. November? 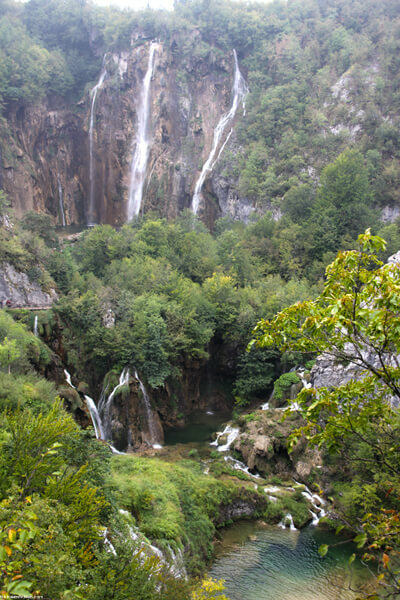 There are some other waterfalls that are similar nearby Split. I wish we would have checked out that park to see if it is less crowded than Plitvice. Maybe in the spring. So sorry to hear that Plitvice Lakes didn’t live to your expectation. I’ve read few other posts where people complained about organizational issues at the Lakes (paths not well marked, buses and boats just too crowded, etc.). It made me nervous just reading about walking on the narrow paths full of people and not being able to escape. We’re planning to visit next weekend. It’s early in the season (even boats and buses don’t run yet; and the entrance ticket is a half price). I hope that we won’t have crowds at least. As for the weather I also hope to be able to capture some nice shots, and I need blue skies for that. But whatever happens, no influence on that part. How did your trip to Plitvice go, Frank? And have you been to Krka? I wonder if Krka is better since you can actually swim. I love this place and have been three tines. End of summer not best time to go but still beautiful. We went after few days of heavy rainfall on one occassion and was amazing. That’s good to hear Daniel! I think you would definitely need some rainfall before a visit to get those falls going. It just didn’t “do it” for us. But that’s okay. well here’s something novel to consider – YOU made up part of the crowds, didn’t you. And just so happens that many other people had the same idea as you, to go visit the lakes. i think it’s a bit rich for you to complain about plitvice lakes, when really the problems you describe are not about plitvice itself. problem was ‘tourists’ and ‘weather’. that, and that you’d crammed so many places and countries into an impossible timeframe, making it hard to enjoy really any one place. Nope, Janice. 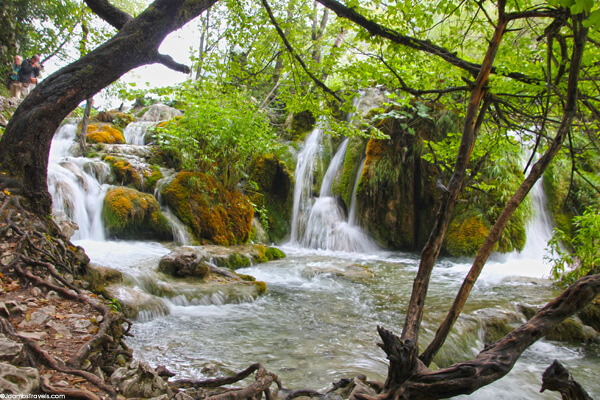 Plitvice proudly displays a sign that more than 1.2 million visitors are counted each year. It was extremely crowded to the point of un-enjoyable. Are there other times of the year when it may not be as crowded? Probably. While we appreciate your comment, this is ultimately a blog and we are entitled to our opinion. We didn’t enjoy Plitvice and it’s not a place we can glowing recommend. We keep it real around here and tell it like we see it. The scenery was just okay, in our opinion, and we’ve frankly seen far better. Not everyone is going to love every place or every thing. 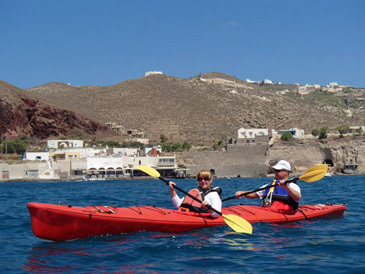 Our road trip wasn’t an impossible time frame – it worked for us and how WE enjoy traveling. We’re extremely active. That busy schedule certainly isn’t for everyone, just as slow or long-term nomadic travel isn’t for us. 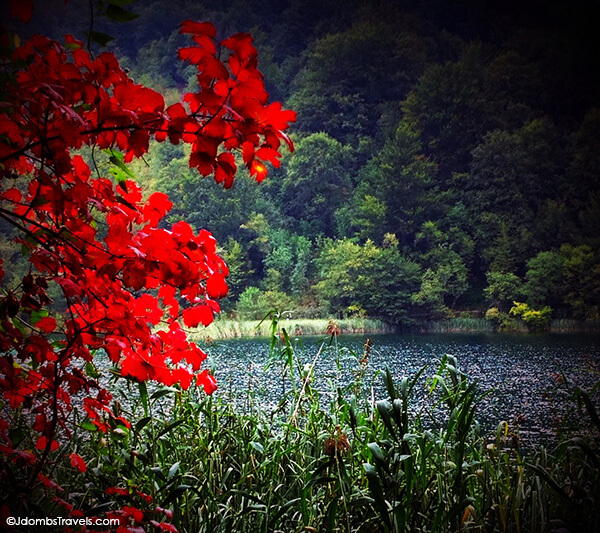 I am planning to visit Plitvice Lake 2015, when is the less crowded month ? 1. Krka is just as crowded and not nearly as impressive as the photos. 2. Saying “go to instagram and check out photos of ppl saying wow” isnt an argument . Most ppl wow at a rock. 3. Croatia is pretty but not nearly as pretty as to have all this arrogance about its places. I agree with you, Jennifer. I have seen way better. 4. I never go back to a place, its just a principle of mine, but definitely would not come back to Croatia willingly!